I’m pretty sure Betty Ford never considered herself a titan, but she certainly was willing to tell the truth. But in order to have the alliteration work, I needed a word that began with a “t” and titan is what came to mind. Apart from Greek mythology, a titan is someone who stands out for greatness of achievement. Betty Ford certainly achieved great things, especially in things people were reluctant to talk about. We’ve been hearing snippets about her life since her death on July 8. Weird twists of fate thrust both her and her husband, then member of the House of Representatives Gerald Ford, into the national limelight when President Richard Nixon nominated him to succeed disgraced Vice-President Spiro Agnew in 1973. Then, when President Nixon resigned in 1974, the Fords assumed their roles as President and First Lady. What do any of us really know about people in public life. So much of what we come to know about them is what we see or read in the media. We’re not privy to their private lives nor included in their inner circles. But Betty Ford gave us a glimpse that even people in public life face the same secrets that regular people face. She didn’t hide behind secrets or shame, but exposed herself truthfully. And in doing so, opened a new conversation for all of us. Mrs. Ford was diagnosed with breast cancer shortly after becoming first lady. This was before people talked publicly about cancer and certainly not about breast cancer! Being open about her own breast cancer and treatment brought awareness and willingness to talk about something that was a reality for many women and impacted many families. Her greatest legacy is certainly her openness about her own chemical dependency and founding the Betty Ford Center. Nowadays we’re bombarded about celebrities’ struggles with drug and alcohol abuse. But Mrs. Ford’s courage and truthfulness about her own issues with medication and alcohol was unheard of in 1978. Rounding out her legacy is her commitment to women’s issues: the Equal Rights Amendment, pro-choice, gun control, equal pay, women’s status. She was not only vocal about feminist issues, she was out there leading marches and conferences! Betty Ford had the final word, even in her memorial services. She selected who she wanted to speak. Political correspondent Cokie Roberts, whose Democratic father was a close personal friend of Gerald Ford’s and close friend Rosalyn Carter, whose Democratic husband beat out her Republican husband for president in 1976 spoke of a woman who lived a life connected and with conviction. 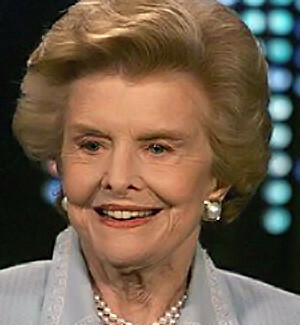 Betty Ford was certainly a truth-telling titan…rare and refreshing. Thursday bonus: Here is Cokie Robert’s 13-minute eulogy of Betty Ford. Insightful. I wasn’t able to embed the video in this post. You’ll be redirected to the ABC News site.